We finished up work on Mom’s projects today. The batik quilt is trimmed and packed up to be shipped – she’ll bind it at home. 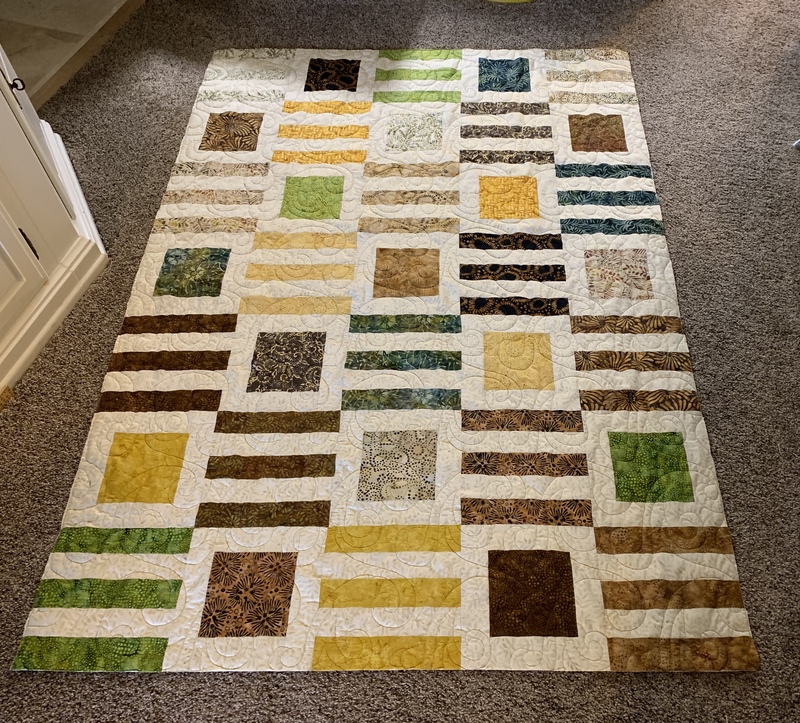 We also took one of the Jelly Rolls and did some cutting so it’s all ready for her to make a Framed 16 patch quilt. Can you believe all we accomplished? And she’s got a lot to work on at home! After we finished her projects today, we cut the blocks for an Ohio Star quilt of mine. Stephanie has chosen Fat Quarters as the precut for February and I’ve got a jump start! Bravo! It looks like you’ve exceeded the goals for your Mom’s visit. I love that you share a common hobby. No, I can’t believe all that you accomplished! it made me tired just reading about it all! You are both so talented and unbelievably accomplished quilters! I did enjoy reading each and every post about you and your Mom. She is such a sweetheart! and I’m glad she is feeling better now. So happy that you got done what you wanted and more. Love the fact there are extra kits! Oh I am loving that quilt!! It’s has to be such a great feeling to spend such quality time with your mom. It’s a benefit of being past the child raising, working, etc. time of our lives. Give her hugs, tell her we look forward to her finished projects. And pet that Finn for me! This time together has been a fun quilters retreat and family time for the two of you! I hope your mom will be able to travel to stay with you again, even though there are challenges in travel. I’d love to be in Florida right now. We are staying in southeastern WI right now. We have a precious week old granddaughter now. After a snow storm passed through we may delay our return to Mn until Saturday when the polar vortex is supposed to release both states from its icy grip. Mary, I absolutely love the batik quilt. Great pattern for when you need a manly quilt – simple, quick yet striking. Thanks for sharing and bravo to you and your mom for all that you have accomplished. altho we’re well into it….happy new year….another thing am late for….